Photo by Marc Fowler/Metropolis Studio. Chains and chokers have made a comeback. The 18-karat gold and nine-carat diamond Bulgari Roman necklace and matching earrings hold ancient Roman coins at their centre, offering a one-of-a-kind statement that will be passed down for generations. (Necklace, $52,450; earrings, $18,500). 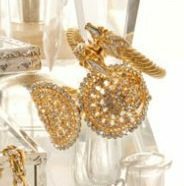 Keeping with ancient times, the Equine bracelet is hand-carved in 18-karat gold, with diamond and ruby accents; it’s stackable but can easily stand on its own ($12,550). If you’re in the market for a new, distinctive ring, look to the Golden Leaf Ring in rose gold with diamond accents ($3,175) or its counterpart, the Kiss of a Rose ring, which features a delightful pear-shaped diamond ($23,000). Howard’s Jewellers, 220 Sparks St., 613-238-3300. 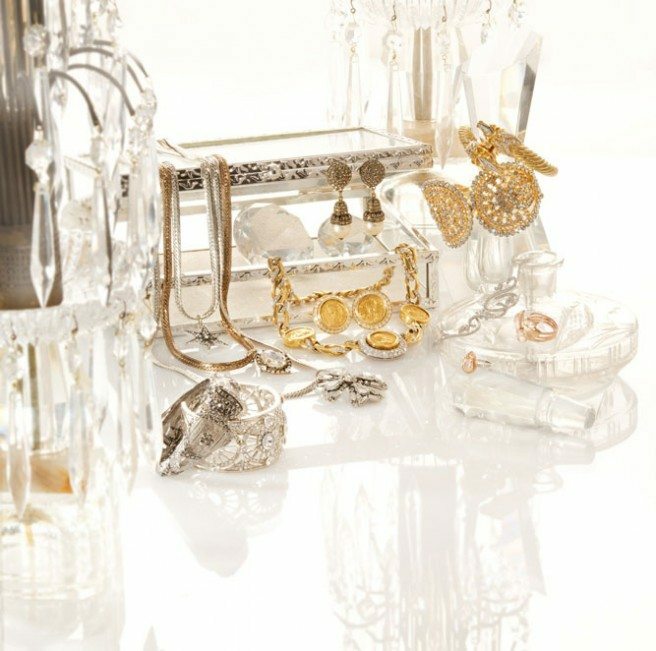 The silver and glass jewellery box is modelled after museum display cases and is lined with linen to showcase your treasures. $102.69. Available online from Pottery Barn. Add stackable cuffs to your jewellery box, mixing dainty with daring for true wrist appeal. (From left: oxidized silver bangle with black crystals, $95; silver and clear crystal bangle, $95; gold metal bangle with clear crystals, $69). If you’d rather layer elsewhere, try a necklace that does it all: delicious pendants in mixed metals for pretty and punk allure are the ultimate game changer ($95). Or perhaps you’re after a Gatsby moment? Opt for vintage pearl clip-ons for a pop of posh ($275). True Bijoux, 206 Sparks St., 613-232-2229. Bring upscale glamour to a vanity with vintage perfume bottles (tall geometric perfume bottle, $25; short floral-motif perfume bottle, $38). The White Monkey, 395 Gladstone Ave., 613-321-4678. Dress your vanity with the inviting glow of crystals and vintage flare. The crystal vanity lamps (set of two, $300) bring warmth to a room while illuminating your most cherished charms. Architectural Antiques, 145 Spruce St., 613-722-1510. Tranquil and serene, this 18-karat diamond necklace with blossom and leaf detail (far right, on perfume bottle, $10,600) reflects unique style. Dripping with femininity, this piece acts as the finishing touch to a polished look and draws attention to a woman’s décolletage. Jubilee Fine Jewellers, 50 Rideau St., 613-238-1886.